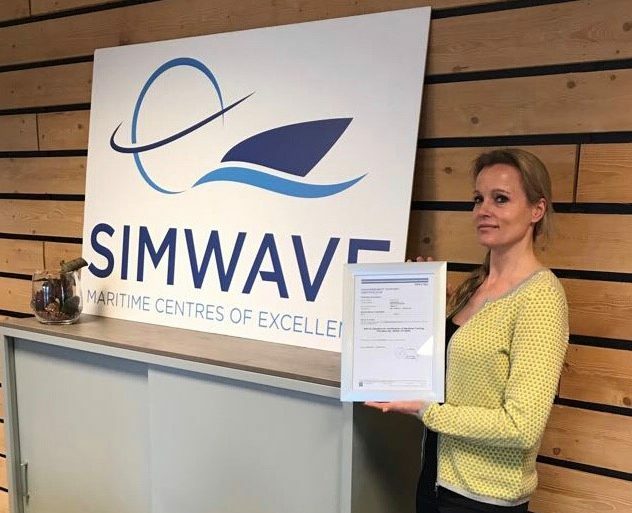 Simwave is pleased to announce that the management system of our maritime centre of excellence has been audited and that it fully complies with the requirements of DNV-GL Standard for Certification of Maritime Training Provides No. DNVGL-ST-0029. We are extremely proud that before the official opening on the 19th of April 2018 we already have our certification in place and this confirms the vision of Simwave to become the recognized flexible, approachable and cost-effective training, assessment and applied research partner of choice to enhance safety, efficiency and readiness. The first training, among Bridge Resource Management (BRM) for the cruise industry, ECDIS/RADAR training, inland shipping training as well as different engine room trainings have rated overwhelmingly positive. The first open courses are online and specialized courses can also be booked, among ice navigation (POLAR code), different LNG- courses, Ship-to-Ship Transfer etc. Feel free to contact our customer service manager for more information regarding our courses and possibilites.